Many years ago, most hardcover books came in plain cloth or hard paper covers, not illlustrated. A discerning reader had to read the inside of the flap jacket for a synopsis to decide whether the book might be more interesting than its cover. When paperbacks came out, the classics and non-fiction books were printed in paperbacks with plain covers after a suitable period of time had gone by to give the hardcover edition a chance to make a few dollars. Yes, there were a few good books among these, but along with the plain, scholarly paperbacks came book covers associated with a lesser quality of writing or cheesier topics. Often a cheap photo or drawing attempted to lure a reader into buying. Times have changed. Now that everyone is a writer, the market is more competitive and since most authors want to realize some sales now rather than 100 years after their death, they resort to a flashy advertising campaign. And it works! Put a boring plain cover next to a flashy modern one, and it’s no contest. Of course, in the end, the real test still lies in the text between the front and back covers of the book. Anita Carroll has helped bring me into the modern age of competitive book covers. 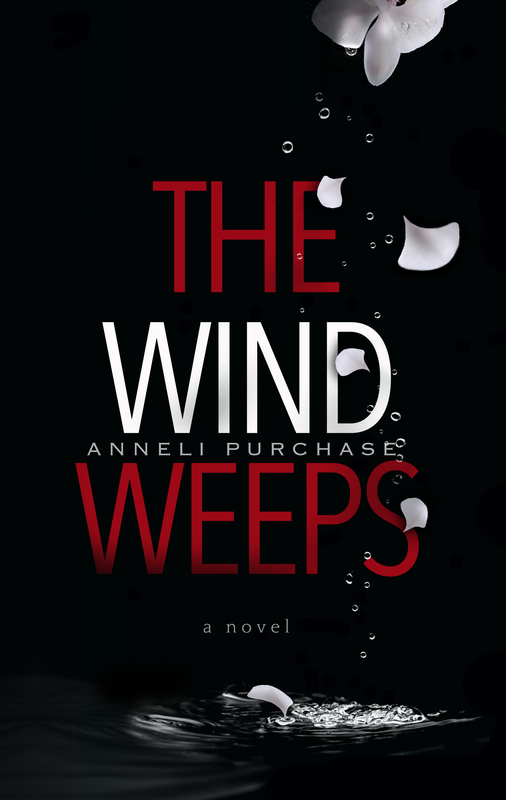 Her amazing imagination has created a new cover for my novel, The Wind Weeps. After reading the book, she said it had the same suspense as the movie Sleeping With the Enemy starring Julia Roberts. I was so pleased that she found it to be a page turner. 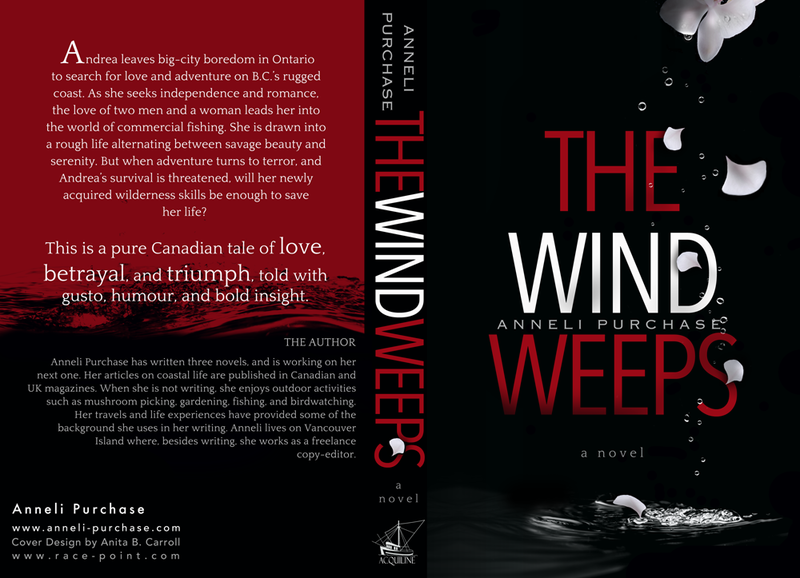 I had thought of book cover images with a stormy ocean, a desperate young woman, perhaps a boat … but none of these images conveyed the terror that is also a part of this love story. Andrea’s husband brings her orchids. Perhaps orchids could feature in the cover? But the cover image can’t be too rosy (sorry for the pun). It is also a dark story – the kind of darkness that makes you want to turn the page, looking for the light. She really came through for me. I was shocked at first because it was so different from what I expected, but she has captured all the elements of the story. The delicate orchid, the tears dripping from it into a desolate ocean; love gone wrong. The red sky symbolizing (for me) pain and fear, and the dark, rough ocean symbolizing Andrea’s remote isolation and desperation. If you are looking for someone to design and create your next book cover, why not give Anita Carroll a try? Categories: B.C. coast, Books, British Columbia, Fishing | Tags: Anita Carroll, Anneli Purchase, BC coast, book covers, commercial fishing, domestic abuse, graphic design, isolation, romantic suspense, writers, writing | Permalink. Thanks, Terry. It was not at all what I expected, but it has all the elements that the book needs. I like bright colours, so it took me aback when I saw the red and black but it was perfect for the suspense in the story and my character’s dark and dangerous mood. I hope there will be some adventurous readers out there who will take a chance on my book. A fitting cover for the quality content. Thanks, Darlene. Dark and dangerous. Yes, partly, books, wine, music. I might be wrong, that is the cover..
Bless you, Julie! I hope you enjoy it. Yes, the cover is VERY different… and… aggressive. Thanks, Victor. One of my characters is VERY aggressive, so that fits very well. That would be very nice, Robin. Our local libraries carry my books so I don’t see why your library wouldn’t order them if they had a request for them.